Builder confidence in the market for newly made single-family homes this month shows a year over year increase, signaling strong months ahead. 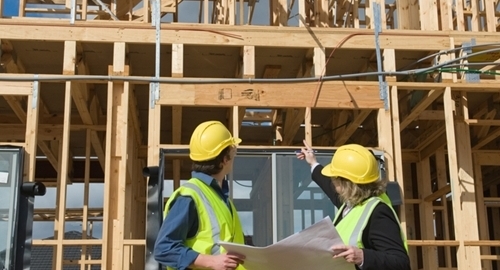 A new report by the National Association of Home Builders (NAHB) shows confidence levels at 54, a nine point increase from the same period last year. Though the index is slightly down from April, where it was at 56, the year over year increase is enough for NAHB experts to predict a solid outcome for 2015. "Future sales expectations has been tracking upward all year, mortgage rates remain low, and house prices are affordable. These factors should spur the release of pent-up demand moving forward," said NAHB chief economist David Crowe in a statement. The NAHB/Wells Fargo Housing Market Index (HMI) reports confidence levels of home builders over a specific time period. NAHB surveys builders asking them to rate their perceptions of current home sales and sales expectations as "good," "fair" or "poor" over the next six months. It also asks them to rate traffic of prospective buyers as "high to very high," "average" or "low to very low." An index of 50 or more indicates high confidence in the market for that category and time period. The May HMI reported sales expectations in the next six months at 64, a one point increase from the previous month. Sales conditions dropped two points in May, still well above the 50 mark at 59. The only category below 50 was that measuring buyer traffic, which was down one point to 39. Measured regionally, the three-month average for the Midwest and South each rose one point to 57 and 55 respectively, while the West fell three points to 55 and the Northeast lost one point, down to 41.